Stand Up and support accelerated cancer research in this comfortable Stand Up To Cancer women's arrows T-shirt. This breezy modal tee, with a silky modal knit fabric and dolman sleeves, features our new eye-catching logo with metallic trim. 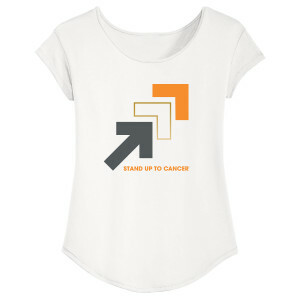 This stylish design is a great choice for joining in the fight against cancer. I love my new top...it fit perfect &amp; I'm proud to wear it for all survivers &amp; knowing the cure for Cancer is TODAY? ?